Whenever we come across a book which is targeted for children, we often think, it should have been quite easy to pen a book for these little fellows. On the contrary, it is not a child’s play :). Just try to make up a story when you are trying to make a child feel asleep and you will realize that you have to sum up the things logically too. If you cannot convince a kid, then he/she will not enjoy the story. At the same time, you cannot go in a way too logical, you need to create a fantasy world for him/her in which he/she will like to wander. 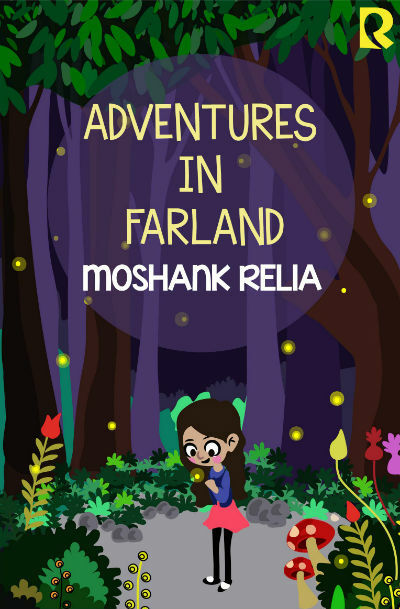 Recently I got a chance to read a book named Adventures In Farland penned by debutante author Moshank and published by Rumour Books India. The title of the book will definitely remind you the same of a very popular story for the kids – Alice in Wonderland. And the cover page of the book is quite interesting, especially considering the target readers for the book. Does that mean there is nothing for the young adults and adults in this book? Well, rather than just giving yes/no answer, let us take a brief look at the story and various aspects of the book. Mira is a cute young girl. She is doing her studies regularly and she also helps her mother in running the flower shop they own. In absence of her mother, she also manages the shop. She takes care that the shop should open on time even if her mother is not there. Bira and Vira, two potbellied kids are her friends. Bira and Vira are twins, but they often found having a tussle with each other. No matter what, they will find a reason to be in a fight with each other. On a one fine day, when Mira, Bira and Vira were playing around the top of the hill, they meet Bushy. Bushy came from Farland and Mira had the idea about him through the stories she used to hear from her mother. Though, she is meeting him for the first time. Bushy wanted to invite Mira, on behalf of Princess Harmonica of Farland, for a party arranged there! Mira was in a dilemma because her mother was away and she needs to open the shop on time the very next day. She was affirmed by Bushy that she will be back on right time. There was one more problem. Bushy was not keen to take Bira and Vira with him as they keep fighting with each other which resulted in a ruckus. She, however, was able to convince Bushy to take her best friend along! There was a condition, though! What was the condition? Will Mira, Bira and Vira all be able to reach on time for the trip? What surprises await there for them? All these questions are answered in this short book. And yes, eventually you meet many people from Farland including but not limited to Starhead, Queen Halo, Saltman, Mastiff, Fat-master, a Witch, a Crow, a Cat and a Giant. The book is targetted to a special group of readers and should be read in the same context. The book is comparatively small but tells a complete story from the target readers’ perspective. While many incidents and characters of the book will remind you of that of “Alice In Wonderland”, the book has a lot to offer. It is a non-complex, straight-forward story which takes the reader into a new world, the world of imagination. Which Mira is the protagonist and thus the most attentive character of the book, the rest of the characters a are also given due space. I wish though, a little more footage could have been given to the character of princess Harmonica. New characters are kept introducing at a regular interval and it will keep up the interest of the readers. Same way the pace of the book is good (for the target readers mainly). And thus it keeps the kids hooked to it. Though there is no scope of some philosophical masterpieces or life lessons, the book mentions morals and ethics at places. It is done in a way that kids can easily relate to the same. Here are some of the interesting lines from the book. Bira snatched the water bottle from Mira’s hand and drank like a thirsty puppy. She was a brave girl, but her bravery faltered when the right wing of the plane actually stopped working. The New Moon Party was the place to be. The dragon is still sleeping soundly, and he will never be of any harm to us unless Ugly the Giant is standing by our side. Talking more about the book will bring up some spoilers which I am trying to avoid. But, I can surely add that the author knows his job, that is, how to write for the kids. His exploration of scenes and surrounding is really good. Some illustrations are included in the book and children will surely love them. If you think from the target reader’s perspective this book is really worth reading. The ideal price of the book should be somewhere around INR 50.